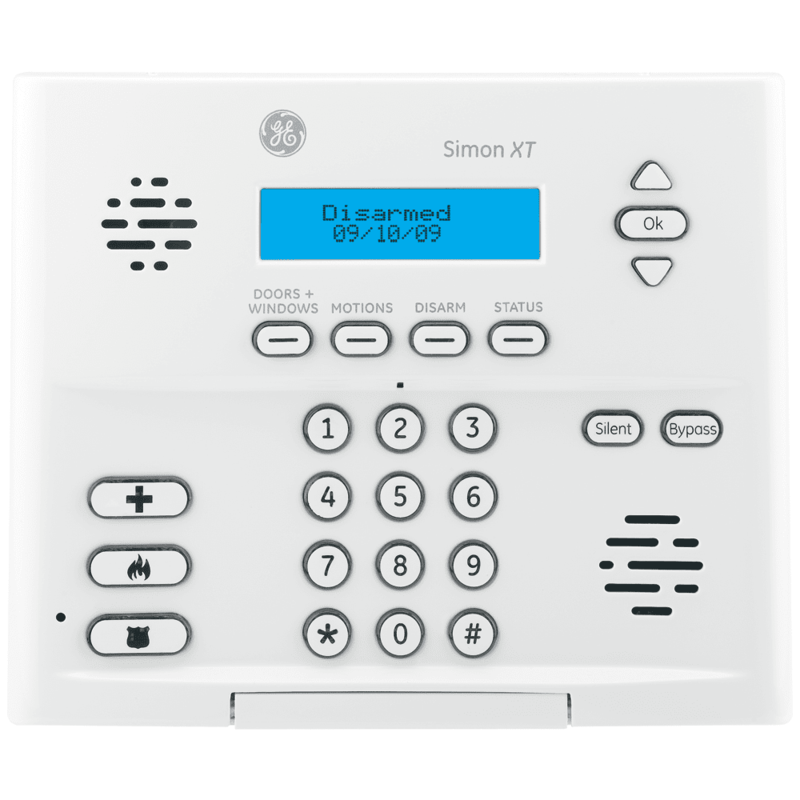 The Interlogix Simon XT is a cost-effective security system that offers up to 40 zones of burglary and fire protection, and which complies with SIA False Alarm Standards. With a built-in display touchpad and a status speaker that provides visual and voice messages for feedback, Simon XT is well suited for houses, apartments, and condominiums. Optional LTE reporting and Alarm.com features support off-premises control to arm and disarm the system, check system status, activate no entry delay, or activate the latchkey feature. The Simon XT panel comes standard with 40 wireless zones, or it can be set up with 38 wireless zones and two built-in hardwired supervised burglary zones (normally-closed loop only). The built-in radio receiver works with both crystal and SAW LearnMode™ sensors. Simon XT supports convenient system operation from anywhere within the premises with the use of wireless Two-Way Talking Touch Screens and/or touchpads. Optional Keyfobs (two- and four-button versions) can also be used for convenient local system control. In addition to using the Simon XT as a security system, optional wireless devices can be added to provide control over other functions for added convenience. These devices include Z-Wave® wireless lighting control devices, Z-Wave wireless thermostats for home HVAC systems and Z-Wave door lock controls. Simon XT can send messages to a central monitoring station using SIA or Contact ID (CID) formats. The panel can also report alarms to another land-line phone location or cell phone using Voice Event Notification. Built-in two-way voice capability with VOX (Voice-Activated Switching) provides additional security and emergency contact with the GeoArm central monitoring station. Hear clearly: Speaker for voice audio status messages and prompts, live communications with monitoring station personnel and configurable "voice chimes"
With the optional cellular LTE reporting and Alarm.com features, Simon XT® features remote monitoring and control of your security system for convenient and effective home protection.